The tables outside are all taken when we arrive, so it’s from behind huge picture windows that we admire the view of the distant Silva Dam. Kalorama Kitchen sits at an intersection on a busy tourist route in The Dandenongs and opposite a popular lookout spot, so it’s only natural the cafe is busy. 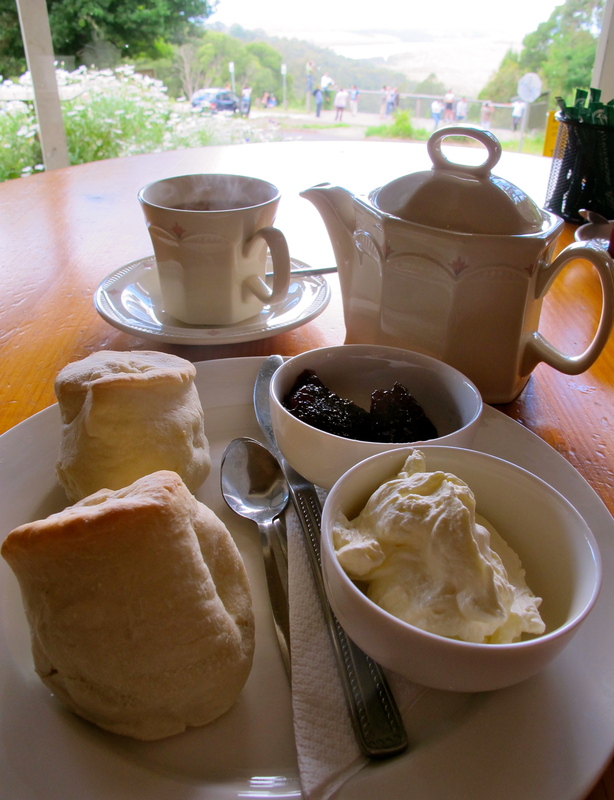 The scones are good – fresh – although we visit late in the day, and we have more than enough jam and cream for both of the scones. 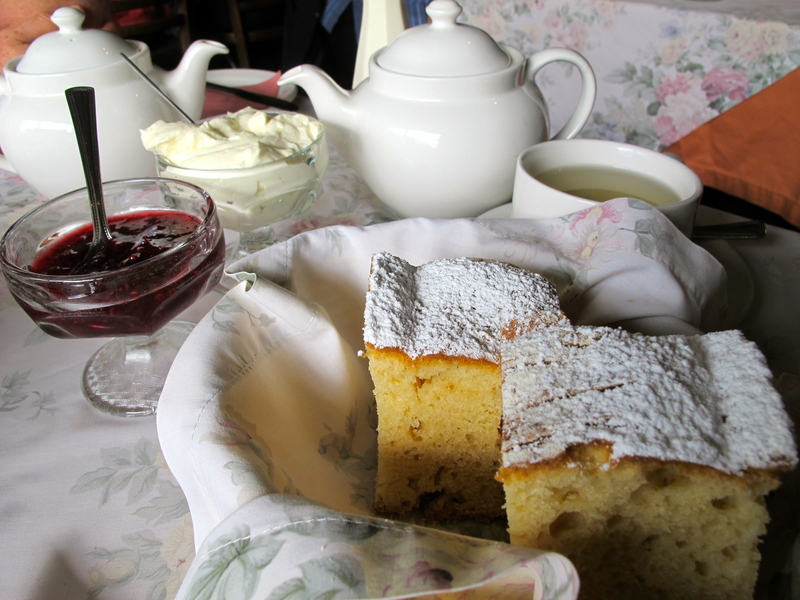 Once again it’s great to see thick rich cream served with a Devonshire Tea. Tea: A variety of teabags served in a pot. This is the second time I try to get into Miss Marple’s. A few years ago, we couldn’t bear the 30 minute wait, but today it’s only about 20 minute so we choose to spend the time wandering amongst the multitude of teapots and teas next door in Tea Leaves. When our number is up and we finally get past the cashier’s desk at Miss Marples we enter a fabricated world of ‘ye olde England’. It’s got to be one of the main tourist attractions in The Dandenongs by the looks of the clientele and the queues. The fruit and plain scones arrive in cake like chunks and are disappointing considering the wait just to get through the door. They’re actually quite tasteless, although they present well with icing sugar sprinkled on top. The tasty raspberry jam and thick cream are truly exceptional and are a must to give the scones some flavour. I can’t even imagine how many trays of scones the kitchen pumps out daily! Tea: Tea bags, bagged up from the wonderful tea shop next door. Overall: An English cottage with an Agatha Christie theme park vibe. We initially stop at Watsons Creek to peruse the antiques, which end up being Edwardian and Victorian furniture and china. It’s hard not to spot the cafe and sitting area along the big long wooden deck out the back. 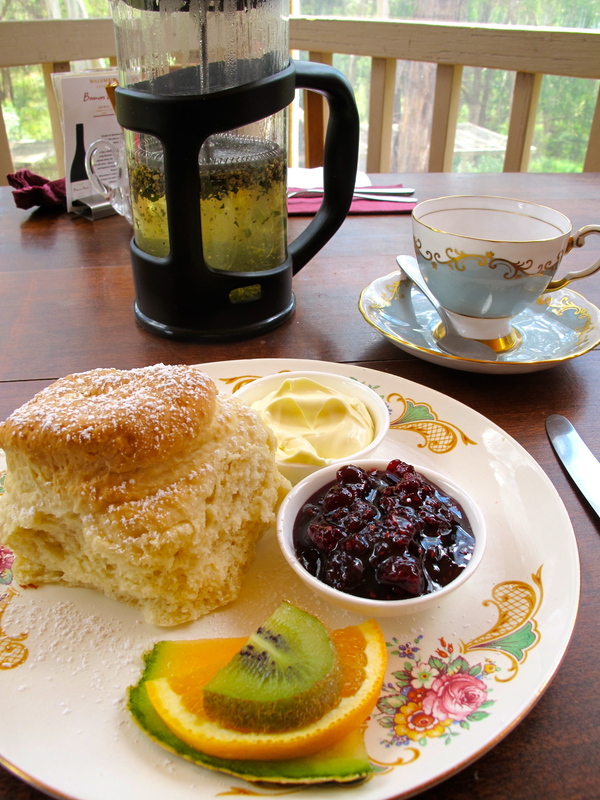 The scones and teas are ordered separately which probably explains why there is only one scone served, but it comes with fruity homemade raspberry jam and thick rich cream. The scone is fresh but has been given a hit in the microwave. I love the cute teacup and saucer but the plunger tea doesn’t quite match – shame there’s not a teapot to match. Tea: A good variety of loose-leaf tea served in a plunger pot. Overall: A relaxing bush outlook from the verandah.